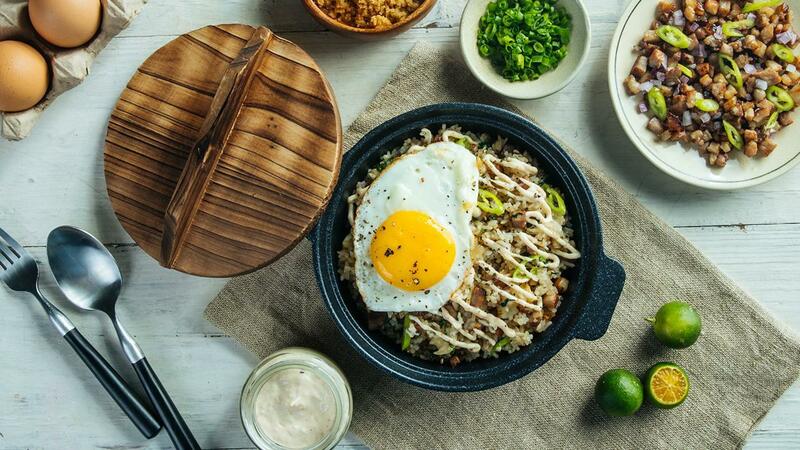 Sisig is truly a staple in Filipino restaurants. Reinvent the dish by turning it into flavorful fried rice! Marinate pork belly with Knorr Liquid Seasoning, Knorr Rostip Powder and crushed black pepper. Place in a tightly sealed container and store in the chiller. Grill the pork belly until cooked through. Let it cool down for a few minutes, then chop the pork into small dice.Transfer the diced pork into a bowl. Add the onions and the chilies. Set aside in a container until ready to use. Chill if not going to be used immediately. Combine the 2 ingredients together in a bowl. Store in the chiller until ready to use. Drizzle with the soy dressing, and the kang-kong leaves. Toss to incorporate all the ingredients together. Taste and adjust seasoning.